The pool season will shortly be upon us and here is what is on the menu . . The Irish contingency had their final outings in Slovenia this weekend with the open water 3km and 5km events taking place in Lake Bled over Saturday and Sunday. 24 swimmers competed in the 3km on Saturday with plenty of vocal Irish support on hand as the swimmers took to the lake over 23 waves throughout the day. Aer Lingus Masters swimmer Dymphna Morris had a superb week in the pool where she focused her efforts on her best events; 200m, 400m and 800m freestyle, picking up gold in all. Morris was also part of the 4x50m mixed freestyle relay team on Thursday to add another gold medal to her collection. Having registered for both the 3km and 5km open water events it was clear Dymphna had her eyes on at least one more medal. Deciding to swim only 3km and give it her all, the Aer Lingus swimmer swam a sublime 40:23.2 to pick up her final gold medal of the competition, a total of 5 golds for Dymphna Morris at this European Championships. Plenty of the female swimmers showed their versatility for pool and open water swimming with Leinster Open Sea regular Charlotte Reid finishing a strong 8th in the ever competitive 35-39 age group. 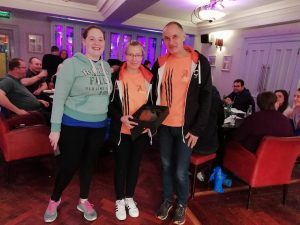 In the same age group Roisin O’Brien finished 20th while Comans swimmers Marie Kean and Arlene Mc Guinness finished 21st and 22nd in their respective age groups. Ann McGrath flew the flag for Dublin SC with a 25th place finish in the 30-34 age group. 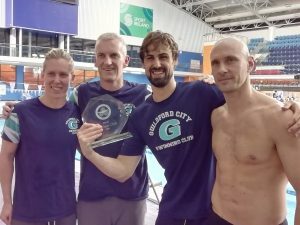 The Donegall Diamonds team who featured in last year’s World Masters Water Polo event focused on the open water this year with four swimmers in action while Templemore swimmer Emma Van Loock also took to the open water. In the men’s 3km event Boyd Freeman of Aer Lingus Masters finished best of the Irish in 7th place in the 55-59 age group after a busy schedule in the pool earlier in the week. Next best was Dublin SC’s Ceall O’Dunlaing who finished 11th in the 45-49 age group, with Mick Kelly of St. Vincent’s finishing 17th in the same age group. As with the pool session during the week there were plenty of Aer Lingus Masters swimmers in action; Peter Conway (32nd), William Irwin (53rd), Liam O’Gradiagh (66th) and Liam Ryan (68th). Other swimmers in action in the men’s race were Templemore Masters swimmer Ciaran’Flaherty (33rd), Ennis Masters’ Paschal Phelan (39th), Eamon Dempsey (46th) of Glenalbyn Masters and Kilkenny’s Duncan Russell (54th). The final event of the European Masters Championships was the 5km open water on Sunday morning. Just two Irish swimmers took to Lake Bled for this event. Brian Harris of Asgard SC travelled to compete in this one event, putting in a solid swim to finish 10th in the 40-44 age group in 1 hour 1 minute. Paschal Phelan of Ennis Masters showed true grit to compete in both the 3km and 5km events this weekend and had the honours of final Irish swimmer at this competition to finish 29th in the 50-54 age group in 1 hour 13 minutes. Congratulations to all swimmers who competed across eight day of competition in Slovenia. Irish swimmers are bringing home a total of 14 medals; 8 gold, 2 silver and 4 bronze.